Holy High-Definition Batman! 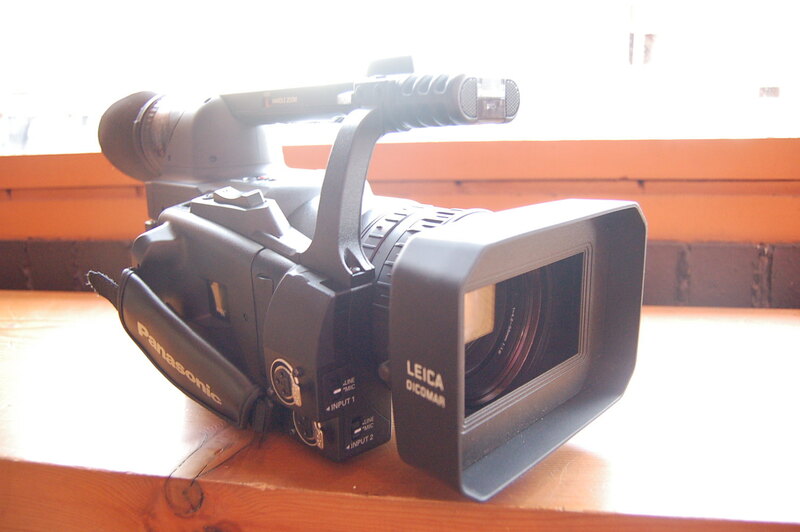 NWFF is now the proud owner of a High-Definition video camera, the Panasonic HVX200. The truly innovative quality to this camera is that it records video without using tape. High defintion quality video goes straight onto memory cards that can then be inserted into a computer and downloaded into an edit system. It’s a very different method than shooting on tape, but one that has many advantages. In some ways it’s more similar to shooting with film where a camera operator has to manage changing magazines during a shoot, but it has the added benefit of allowing you to view your clips immediately after filming them. We’ll be offering classes on how to use the camera soon and renting it out to our WigglyWorld level members at a very reasonable price. The DVCPRO-HD format that the camera uses is perfectly compatible with our G5 edit suite. Interesting article about Canadian cinema, with special attention to LE CHAT DANS LE SAC, just posted on Siffblog. LE CHAT plays at NWFF next Tuesday & Wednesday at 7 and 9pm, the first of four films in our CLANDESTINE TRUTH: THE CANADIAN NEW WAVE series, which runs through April. More CLANDESTINE TRUTH series information here. Drinks before or after the show while you’re Waiting for Godot? Just show CHAC staff your NWFF Membership card or ticket stub from NO RESTRAINT or WAITING FOR GODOT! I’m sure there are thousands, probably millions, of artist/director blogs out there, many mandated by film distributors out to capture the freethinking cubicle set, but I came across this one today from Cam Archer, director of WILD TIGERS I HAVE KNOWN and thought it was worth a visit. It might become more interesting once you see the movie, which plays at NWFF April 13-19. The film itself is quiet, serious, painful, beautiful and slightly embarassing, all of which somehow seems to be perceptible in the director’s (possibly half-hearted and forced) e-diary. Maybe I’m reaching, but for me it works. There’s also some interesting behind-the-scenes WILD TIGERS stuff. David Russo’s new film is moving ahead at full speed. The latest feature made through our Start-to-Finish grant program, it’s a character driven comedy set in Seattle. The Immaculate Conception of Little Dizzle (working title) website is up and running, and contains links to view David’s short films. Local casting is happening now, while David and stellar producer Peggy Case are off to Los Angeles for national casting this weekend. In wonderful news, the project has been incentiveized by WashingtonFilmWorks for cash support of 20% of the in-state budget on the feature. This is a tremendous vote of confidence in the project, and we’re execited to be one of the first independent film suported by the great new Washington non-profit. NPR radio just broadcast an announcement that the ACLU is going to court to fight the state of Michigan’s decision to cut funding for the Ann Arbor Film Festival. Essentially, the State of Michigan found it reprehensible that the festival was screening “pornographic content”. This all came about as a result of an essay written by the Mackinac Center that stated that taxpayers’ dollars should not go to the arts in Michigan. Then the essay goes on to name several films from the Ann Arbor Film Festival. One of the films in question was Crispin Glover’s WHAT IS IT, which we screened late last year to sold out crowds at Broadway Performance Hall. Another is BOOBIE GIRL about a little girl who wishes for larger breasts and then one day wakes up to actually have them, wrecking all sorts of havoc on her life. After a little research you can easily discover that title actually won both an Emmy and and Oscar. We’ll definitely keep a watchful eye on this legal battle, as it relates to institutions like our own and our ability to program controversial content. Tonight Seattle filmmaker John Jeffcoat will be at NWFF to talk about his documentary film BOLLYWOOD AND ME and his narrative film OUTSOURCED. In addition to discussing his process and techniques, and telling stories of filming overseas, he’ll be showing clips of the films — neither of which have yet to premiere in the Northwest. To whet your appetite, John has sent links to two Flickr photo sets, one of behind-the-scenes BOLLYWOOD AND ME stills, and the other of OUTSOURCED press images. You can read more about John Jeffcoat’s work here, and get the details about tonight’s event here. Remember, it’s FREE FOR MEMBERS and only $3 for the general public. See you there. This Thursday NWFF will be host to perhaps one of the most interesting guests in our history. The man in question is an Ex-Con. You read correctly, someone who was not only convicted of a felony, but was sentenced to life in the maximum security prison San Quentin. A prison with notable connections to the art world, for instance Johnny Cash’s live performances for the prisoners. It’s also home for some of the nation’s most notorious criminals, Charles Manson for one. But don’t worry, there is nothing to fear. This man was pardoned for his crimes, and is not only a fully engaged citizen, he is a talented artist in his own right. Rick Cluchey, a former inmate, and founder of the San Quentin Drama Workshop, will present a screening of filmed performance of Samuel Beckett’s END GAME. San Quentin was the home to the second performance of WAITING FOR GODOT in the US. Cluchey was in attendance on November 19, 1957 when the San Francisco Actors’ Workshop presented the play to fourteen hundred convicts. He was amongst those inspired enough to take theatre into his own hands. I often feel like there are moments in history I wish I could have been there for. This is one of them. Thankfully, Thursday I will have the opportunity to hear first hand from Rick Cluchey how that performance affected him. How it transformed his life, inspired him to act, and eventually led to his being pardoned for his work with Beckett himself. And fortunatley this screening and discussion is a moment in history that I won’t miss. Will you? Thanks to all who broke out in a cold sweat with us last night celebrating the Godfather of Soul in the cinema. Kevin Jones (not James) of the Emerald City Soul Club spun funky records before and after the screening. But of course the real treat was seeing rare 1960s performance footage of Soul Brother #1 big, loud and with an enthusiastic crowd! (When was the last time you heard howls, yells, appplause and even soul-claps in a cinema?) It was definitely a proper celebration of the hardest working man in showbusiness. If you’re like me, you’ll call in sick for a day or two while you practice some of those dance moves! Emerald City Soul Club spinning tonight at JAMES BROWN LIVES! Tonight the good folks at Emerald City Soul Club will be in the house spinning great soul beforehand and James Brown classics afterwards. And of course beverages will be available. So join us tonight as we raise a glass to the Godfather of Soul and screen rare James Brown performance footage. More about the screening at our website. 8pm — See you there! Posted in Uncategorized | Comments Off on Emerald City Soul Club spinning tonight at JAMES BROWN LIVES!